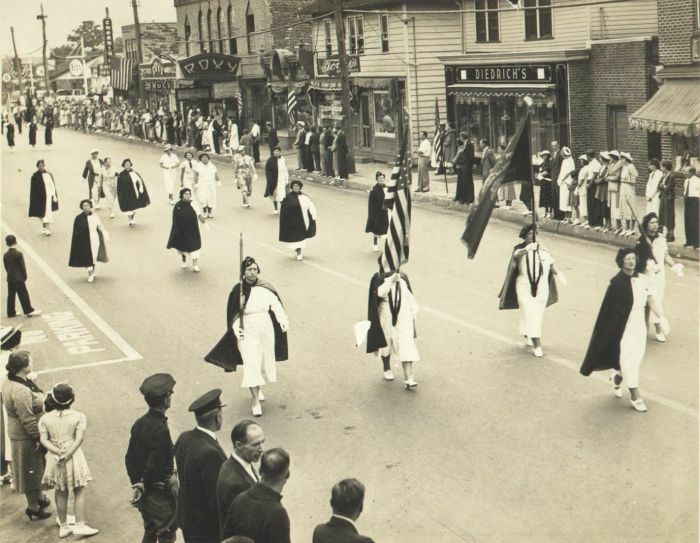 Years ago when I first started my Maple Shade History website I did not know much about the town and relied more on emails from people telling me what was on Main Street, etc... I did not even know at the time that the old Maple Shade Progress newspapers were on microfilm at several libraries. The website then was more folksy and even though I hadn't researched as deep as later on, I think people enjoyed it perhaps more then as they were giving inputs. Later I think I just went to more of my own research work. 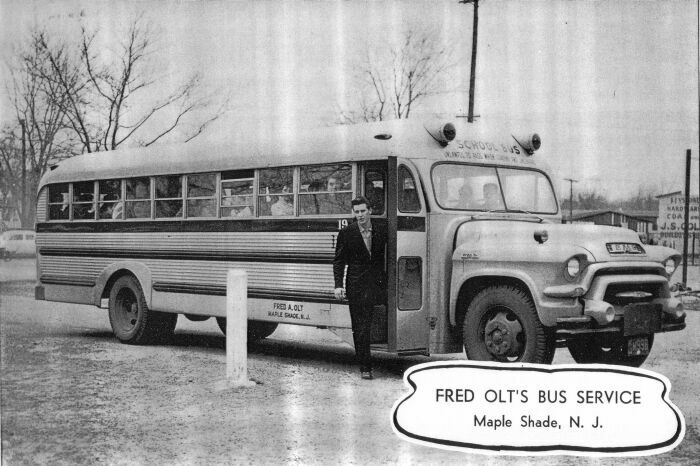 One of the people who used to be a email friend of mine was Fred Olt. 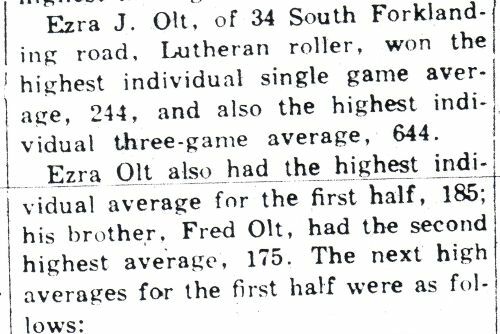 (Fred is the brother of Marion Latwinas.) Below are informations about the Olt family of Maple Shade. 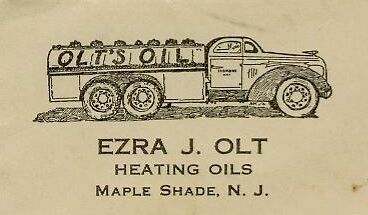 The Olt's were all in oil, except my dad who owned the M.S. Garage. 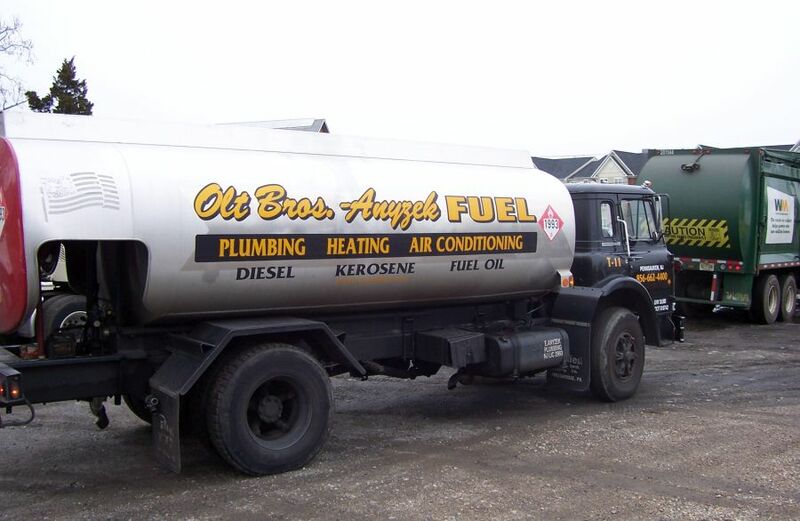 Ezra and Elmer owned Olt Bros.
Bob Bob Olt Fuel in Haddon Twp. 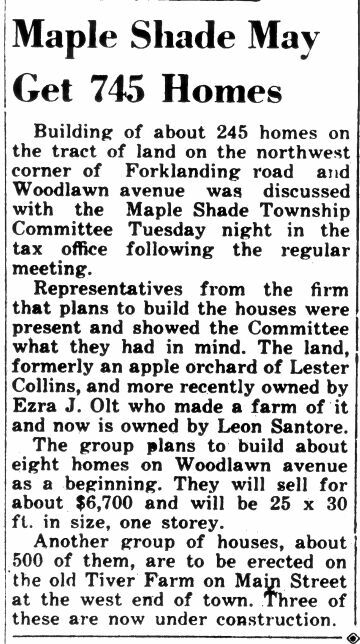 Ezra Olt bought the half of the "Collins Lane house" that was moved to the other side of the street. He later sold the house to the Santore family. Leon J. Santore who owned the Arts and Drafting store on Main St. said the Santore family used the property to raise race horses at. Taken from top the old police-firehouse which is now Fontana's looking west down "old" Main Street. Starting closest to the camera and working away towards The Roxy is Fasto's 5&10.... Diedrich's Bakery (later Paula's).... Tories Tailor Shop... Henny's Meat Market....near the end of the view near the gas station.....Chernin's Shoe Store.... My maternal grandmother, Mae Sipp, is in the second row from flag row and first on left in front of the little boy. 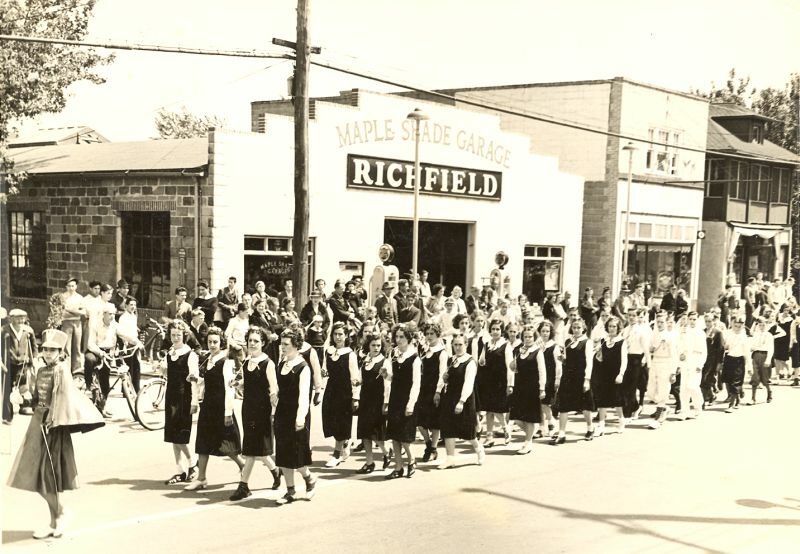 The Maple Shade Garage was on the corner of East Main St. and North Maple Ave.
After the Urban Renewal project the Maple Shade Pastry Shop was there. 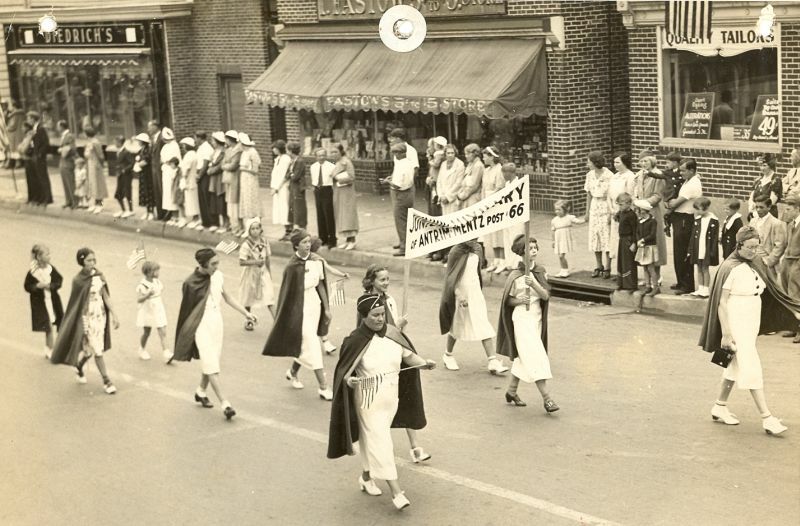 I have a picture of Main Street......taken from in front of the municipal bldg....looking West......it's a parade of sorts and my grandmother is pictured (mom's mom Mae Sipp)....row 2 far left.. I believe it's a celebration (possibly) the 4th of July.....this is a group from the American Red Cross...... 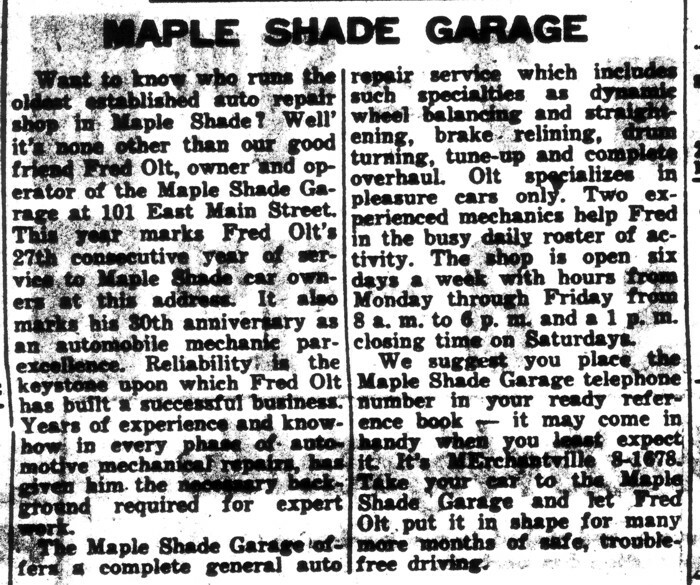 I scanned this and it should fit your screen, and I'll send one more of my dad's garage circa mid 30's.... This picture clearly show's Roxy, Chernin's, Fasto's 5&10, and Tori's meats, Diedrich's bakery, etc.......didn't know their was a gas station at gazebo corner????? Fred sent me these two photos of the family's old house in Maple Shade. years ago and that truck was parked outside. I think they retired now. I put this last on the page as it's not a good quality image.